Well, a lot of pics this time. 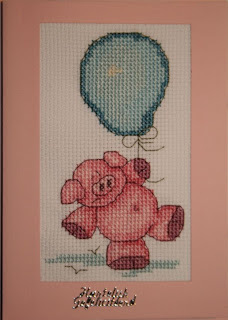 There are the three BDcards, Marlies chose piggies and I got this little one who flew to her with its balloon. 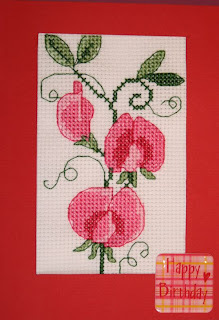 Mireille chose gardenflowers and I thought that sweet peas were appropriate. 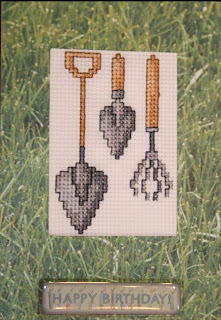 Sonja wanted things to do with the garden, so I sent her some tools. My SAL is finished too, the fabric for the next season is ready cut already. I also stitched the top from Barbara Ana's Frogscornu. Her designs are the theme of the RR I am taking part in. It will be all biscornus. We are 6 in this RR. I also stitched on the Cut Thru' Lighthouse of Bothy Threads. 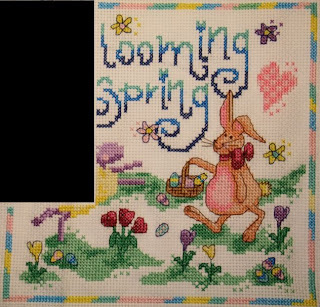 The cross stitching and backstitching are all done. 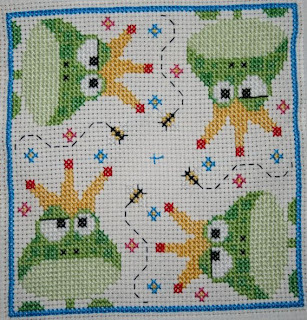 Only the lightbeams which are done in half cross stitches, so it goes very quickly. For next month I hope to finish the lighthouse, the piece I have tot stitch in the RR (designs of Permin featuring a little red car and grey landscapes) and the next BDcard. Probably Summer will be coming up in the SAL too. I asked for a cushioncover from Regenboogkussens for hubby and they accepted. The theme is Scotland. I will stitchEdinburgh castle and my daughter will stitch a piece too, probably the map of Scotland. Other people chose to stitch a Highland cow, a piper and a thistle. 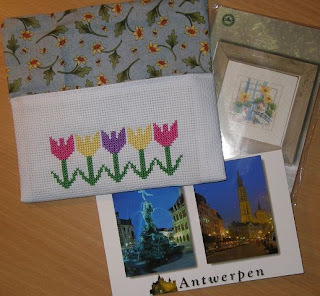 I will have to stitch in secret, it has to be a surprise! 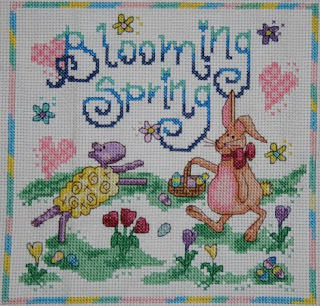 I hope I can stitch in hospital, waiting for hubby when he's treated with chemotherapy. It will help to kill time. Small items like cards are ideal for this purpose. 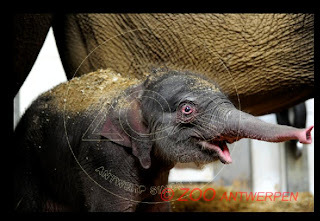 This morning at 8.42 hours I was watching live on the website the birth of a baby elephant in our zoo here in Antwerp. It was so wonderful, I couldn't stop watching afterwards. It's sister and aunt were there when the baby was born, it was planned that way. After 20 minutes the little one (? +/- 100 kilo's!) could stand on its feet. And then the word came out: it's a girl! All of the citizens of Antwerp will receive a birth announcement and there will be a baby drink in June. The baby is an Asian elephant and Tuesday its Asian name will be announced. Of course the coming hours will be still critical, but a good sign is that it already drank with its mum. It's sister is jalous about all the attention the little one gets, but mum and aunty are very cautious. I am so happy I could watch this miracle. It's the first elephant being born in Antwerp, even in Belgium. I will visit it this or next week, when the first crowds have been there to watch it, I have a subscription for the zoo, so I can go as often as I want. On the other hand, we had bad news from the oncologist last Friday, hubby's tumour is growing again, surgery and radiation therapy haven't worked. Next week we will sit down with the oncologist and the surgeon to see what can be done. I really hope there will be something that can be done. Maybe they will try chemotherapy again. At the moment we are in shock, it's so hard, his organs are clean, only the place where the tumour is growing is so hard to reach. We are not religious, so no prayer can comfort us, even now I feel no need to search for a God. This does not mean we are unhappy, we cherish the moments without pain, sit quietly together, a cuddle, a kiss... We don't need many words, we understand each others feelings without talking. I still have good hopes (I am pathologicly optimistic) that something comes up. On the 25th we will know. Meanwhile stitching is a good therapy. Loads to see in this blog. I've managed to stitch all the parts of the SAL that have been sent, so I'm not behind anymore. Part 8 is ready to be stitched, probably this weekend and then it's only one more part before it's finished. Then there is the BD card for Hendrica. She chose purple as a theme. I stitched some pieces in glittering threads, but it doesn't show in the pic. 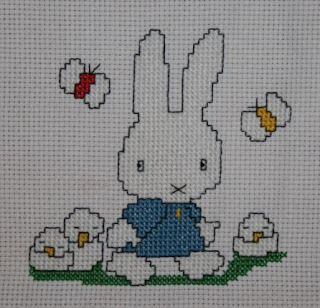 For the charity site of Regenboogkussens, I stitched Nijntje for a little girl who has had a lot of health issues in her life already. I'll show the complete cushioncover when it's finished. Then there is the mailart which had as theme 'countries'. 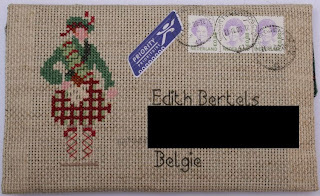 I chose Scotland an Wendy has sent e a beautiful envelope with a kilted person and Nessie in the back, together with Scotland's national flower, the thistle. 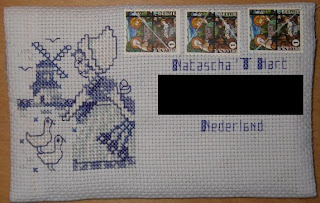 I had to stitch for Natascha, who chose her own country, the Netherlands. 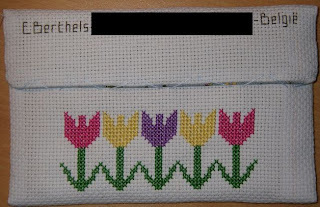 I thought a Delft blue tile would be appropriate and at the back I chose for tulips. She said she liked it very much. I've been sick lately, had a bad cold, was in bed for a cople of days and it seems it's hard to recover from it, as all my reserves are gone during the two agonizing years of my hubbies cancer treatments. He is going to the psychologist now and I hope he can cope better with the situation once the sessions are going at a regular time. 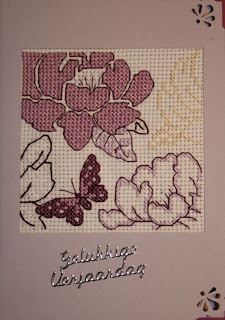 This month I will have to stitch 3 BDcards, the finish of the SAL and my part of the RR. I did manage to do some stitches on Michael Powell's mini Greek island 1 last week, hope to do some more on it this month. I saw he has some beautiful bookmarks, they surely are on my whishlist! My diet is going very slowly, I manage to keep the lost kilos off and very slowly loose some more. I lost 13 kilos (28,6 pounds) until now and I'm very glad with it.